Ipads will be on many children’s Christmas list this year mainly because of advertised hype and the perceived ‘cool factor’ of possessing the latest Apple product. It will keep children amused for a certain amount of time but depending on the apps installed, they will likely gravitate back to their laptop. But for some children – and adults – the iPad could prove invaluable. Read this article which appeared in the New York Times about Owen Cain who has had motor neurone disease from infancy. His parents say he is a normal boy trapped in a abnormal body. “We have spent all this time keeping him alive, and now we owe him more than that,” said his mother, Ellen Goldstein, “I see his ability to communicate and to learn as a big part of that challenge — not all of it, but a big part of it. The iPad has been a tremendous breakthrough and opens up endless possibilities. So many of it’s features ideally suit those who have limited movements, hearing and sight. Owen can have his arm hoisted into a position which allows him, with the lightest of touches, to read a book by flicking over the pages. He even typed up, ” I want to be Han Solo for Hallowe’en” using the onscreen keyboard. Read the story, watch the video. It’s made me think, wonder, cry and plan. You can see Koby Major, age 5, having a brilliant time playing with the Skoog. Inventor and entrepreneur, Benjaman Schogler, came along to demonstrate how it could be used. He worked with all three classes and everyone had a go. Even the very lightest touch can generate a sound. Some pupils hit the Skoog, some squeezed, some rolled it, Jonathon leaned on it with his shoulder and played the flute. Using a WOWee one gel speaker, sound vibrations gave another dimension to the musical experience. Joy, a student in musicology from Greece and on work placement with Benjaman, is going to work with groups of pupils over the next few weeks. Mark my words, there’s going to be a lot of fun and a lot of music happening down at the Hub! Inclusive Technology have a section on their website called HelpKidzLearn with free games and activities. These are high quality resources giving you a taster of some of Inclusive’s bespoke software. From simple Cause and effect switching activities you can progress onto ‘Wait then Press’ activities (eg. Mystery Egg in the Early Years section). Increase a pupil’s concentration and co-ordination skills with Catch the Crocs (games section) or improve letter recognition on the keyboard by playing Letter Pop! (Find out section). Have fun! New products; software updates; innovative use of existing products – there’s so many reasons for revisiting issues previously discussed in this blog. Voice recogntion software is a key area of investigation and exploration. Professional opinon and feedback from users: Dragon Naturally Speaking (latest version is 11) is still the best but the software built into Windows 7 is pretty good too. A demonstration from Craig Mills (JISC) using My StudyBar speech recognition showed that it is possible to get good accuracy from voice to text. Have a look for yourself and see what steps are involved. The computers in schools are using Windows XP and this demo is using Windows 7. Key factors to it working are – competent, literate and motivated user, adult voice, no background noise, ability to identify and correct mistakes and punctuation, no support needed. From discussion at the national ICT ASN group, all authorities are up against the same frustating issue of not being able to offer pupils as a workable option in schools. New guidelines for identifying children with dyslexia were launched by former racing driver Sir Jackie Stewart on Tuesday. The online “tool kit” , available since January but now open to all, has been created for every teacher: we are all responsible for literacy regardless of our subject or sector. The resource supports the Curriculum for Excellence’s emphasis on literacy and numeracy across learning. 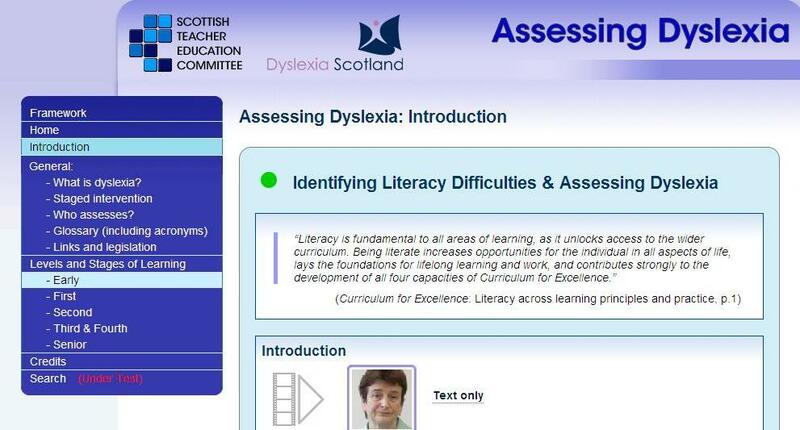 The Assessing Dyslexia Toolkit for Teachers aims to help teachers and early years workers identify literacy difficulties and dyslexia among pupils. A key target is to spot problems as early as possible so children can be given support and are not disadvantaged educationally. A key aim of the new guide is highlighting to all class teachers that they are in the best position to identify early indicators of dyslexia and other learning difficulties. It identifies problems teachers should look out for at various stages in a child’s education from pre-school to late primary, right up to senior secondary and college. It’s superb: check it out. A leaflet about family literacies is now available on the Scottish Government website. The leaflet says parents’ learning helps children’s learning. Family literacies learning describes work with parents to develop their own literacy and numeracy capabilities so that they can support their children’s learning. It builds on what parents and carers already do with their children, whether babies or teenagers. There is no one definition or way of delivering family literacies learning, and it may take place in a broader family learning context. It can involve working with parents alone, or with parents and children together. Candidates with additional support needs sitting SQA exams, currently have access to a variety of assessment arrangements which allow them to demonstrate their skills and knowledge e.g. reader, scribe or extra time. A new assessment arrangement has recently become available. This gives candidates an opportunity to sit digitally adapted question papers provided by the SQA. Candidates with difficulty accessing a standard exam paper as a result of visual, physical, reading or writing difficulties, can now insert answers directly on to the question/answer paper on screen and use speech technology to have text read out. East Lothian secondary schools are piloting adapted digital exams with a number of candidates this session. this development. It is anticipated that Adapted Digital Exam formats will be available to increasing numbers of East Lothian SQA candidates in future. For further information on Assessment Arrangements see the SQA site. Thanks to Linda Gaughan (Inclusion and Equality Officer) writing in the ICT Education Newsletter. “People see you differently,” says 15-year-old Beth Mackie. “The teachers who were there when it happened said it was really scary and they didn’t know what to do. “I had a seizure in the hall and my teachers really panicked. It was chaos when I came round. The first time I woke up, I didn’t know what happened and there were people running around, people shouting. An early guide to the condition was paid for by the then Scottish Executive in 2004 and later revised in line with the Education (Additional Support for Learning) Act 2004. About 2,800 copies of the latest guide have gone to every primary and secondary in Scotland, and requests have been made for another 1,200 copies, including one from an epilepsy specialist nurse in Northern Ireland. Browsealoud is easy to download and could be a great boon for learners with difficulties reading online. LTS is currently looking at how the accessibility of Glow can be improved, and a text-to-speech facility could be extremely useful. They are asking us to help to trial Browsealoud 6 within Glow. It will be ‘speech- enabled’ until the end of January 2010. Trial it for yourselves and let them know what you think here. I downloaded it easily on my work PC and will try it at home on my Mac. So far I find it very user friendly – though perhaps it delays access for a second or 2.